For more than a decade, rock climbers have been discovering the joys and challenges of winter climbs on vertical walls of frozen water. Summer's rushing waterfalls become playgrounds for Colorado ice climbing each winter. For those who are appropriately equipped and trained, ice climbing is not as crazy as it might seem. In fact, it's become increasingly popular with traditional climbers and all-around adventurers alike. If you're fit and gutsy, sign up for instruction and try your hand at this thrilling sport. Twenty-five years ago, a few brave souls discovered ice falls formed by the overflow from Ouray's water supply and began scaling them — reaching places never before accessible. Since then, more and more enthusiasts have experienced the thrill of achieving new heights and physical accomplishment. 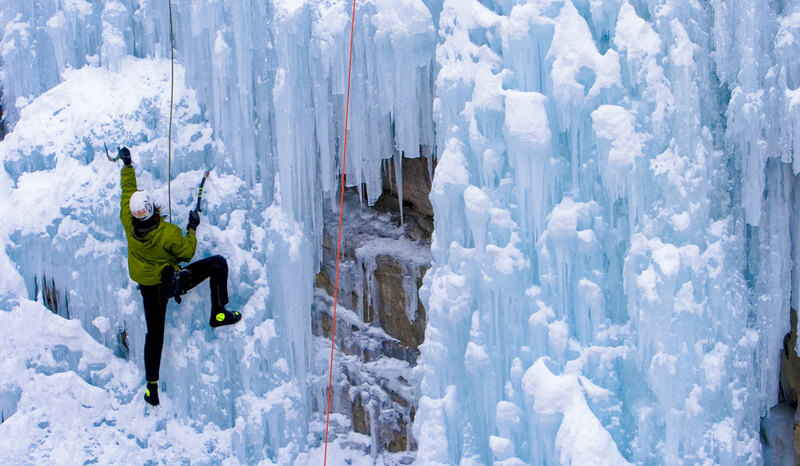 Several areas in Colorado offer ice climbing opportunities, but the folks in Ouray have created the ultimate and complete climbing experience. The Ouray Ice Park, which officially opened in the winter of 1994, has been featured in Climbing, Rock & Ice and other magazines. It was the world's first official ice park, and it put the former mining town of Ouray on the map for its challenging winter climbing routes and ever-expanding terrain. In 1997 the park achieved official non-profit status, and a Board of Directors continues its commitment to increasing the size of the park to accommodate the growing number of climbers and spectators attracted to the area each year. The park has expanded into the pressurized side of the city water supply, rather than the original overflow, and now around 10,000 climbers a year use it. More than 200 routes have been identified and mapped. The park is generally open mid-December through the end of March or beginning of April. Each January, the Ouray Ice Festival raises funds for the Ouray Ice Park's annual operating capital. Since it started in 1995, the festival has grown from an entertaining event for more than 300 climbers its first year, to approximately 3,500 visitors in recent years. In addition to hosting legions of climbers, the park's viewing platforms accommodate spectators as well. Sponsors provide gear demonstrations throughout the event, and competitive climbers from all over the world display breathtaking ascents for enthusiastic crowds. Ice-climbing clinics, an equipment bazaar and other events make this popular festival one to remember. The surrounding San Juan Mountains are some of North America's most popular locales for ice climbs. Outfitters like the San Juan Mountain Guides are local experts and can set you up with all the instruction and gear needed to safely explore the area's ice climbs. Farther east, Lake City is also a popular ice-climbing locale, with a climbing park just a few blocks from downtown that's open December to March, depending on weather. And Rifle Mountain Park, in Colorado's northwest region, is a premier spot in a box canyon filled with routes.